There was little awareness among Thai people about their heritage. Khun Julasak Suriyachai, a teacher and an art connoisseur made a big difference. Khun Julasak realized that soon the heritage of northern Thailand only could be seen baroad. Hence, he started collecting northern Thailand's art pieces and founded the Lanna Heritage Conservation Center, the seed of the present Oub Kham Museum. 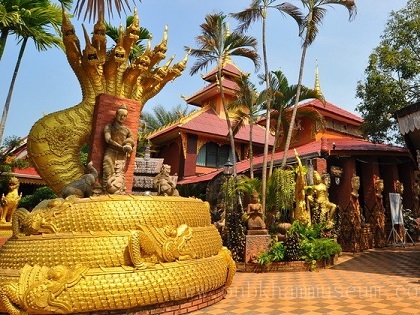 His collection includes valuable artifacts from the Lanna kingdoms. The people of thest kingdoms developed a similar culture whish one might call the 'Culture of the Dhamma Letters'.